We’ve recently conducted a study among Work Comp Adjusters and Nurse Case Managers, asking them: “What are the most important factors when choosing a work comp doctor?”. The response we received was overwhelming. Let us begin from thanking everyone who participated in the study and took time to help us improve our Workers-Compensation-Doctors.com directory even further and provide an even better service to all of its users. Thank you, we really appreciate your feedback! 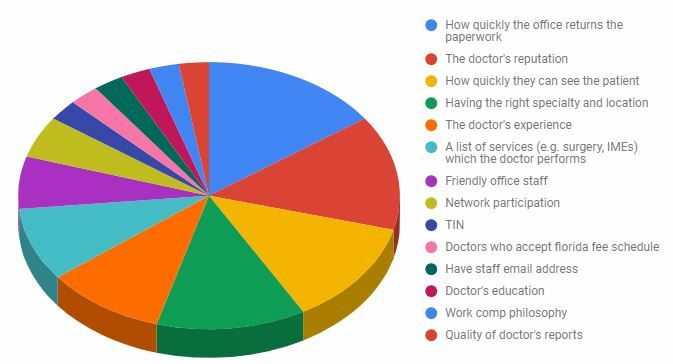 According to the graph above, the thing Adjusters and Nurse Case Managers care most about is the time it takes the office to return the necessary paperwork. This particular factor was chosen by over 15% of the study participants. The doctor’s reputation and experience also play a great role – these factors were named by 13% of Adjusters and NCMs. 12% of responders said that the quicker the doctor is able to see the patient the better. The doctor’s specialty and location were chosen as the 4th most important factor – also 12%. Other factors, such as network participation, TIN, or friendly office stuff, were also mentioned here and there, but definitely less commonly (<5%). Taking all this into consideration, how do we implement the results? The great news for Adjusters and Nurse Case managers is that they can easily browse the doctors in our Workers-Compensation-Doctors.com directory by almost all of the above mentioned factors. You can filter doctors by their reputation (other Adjusters and NCMs reviews), specialty, location, network participation, etc. Does the doctor accept Out-of-State insurance? As you can see, your feedback helps us move in the right direction and customize the directory to meet your needs. If you ever think of any other way we can improve it, contact us and we’ll see what we can do!